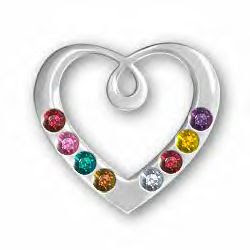 This is something new that I LOVE...this sterling silver charm/pendant is totally customizable with up to 8 genuine Swarovski crystals. Perfect for any Aunt, Grandmother, Mom, the possibilities are endless! You can even add this charm/pendant to a dainty chain for a sweet necklace or to a larger link charm bracelet. Check them out...they are GREAT Christmas gifts! Yep...it's that time again! I am hosting another great giveaway...you won't want to miss this! I am giving away a custom *you design it* Mommy bracelet and also a cute little girls Christmas bracelet *picture coming tomorrow*. Click HERE to enter or visit my website http://www.mymommysbracelets.com/. There are so many great boutiques participating...don't forget to check them all out so you can get started on Christmas shopping! GOOD LUCK...contest ends October 31, 2008 at midnight central time! Breast cancer is very near and dear to my heart...my Grandmother lost her battle to this horrible disease when I was a little girl. Unfortunately I was so young that I don't have any memory of her. Medicine has come a LONG way and they are making huge strides in the treatment of breast cancer. Early detection is best so PLEASE *pretty please with sugar on top* go get a mammogram! Because of my family history I got my first *baseline* mammogram when I was only 25 and continue to get them every 5 years until I am told otherwise. Thankfully I have been blessed to have my screenings turn out negative for cancer...but others are not so fortunate. Show your support to all women that have battled, are battling, and have lost their lives to breast cancer by wearing pink ribbons all month long. I have a whole section on my website that is dedicated to "Awareness" with several designs for breast cancer. Visit it HERE. Also...click on the button in that section and help to give free mammograms to those women that are not able to afford them. 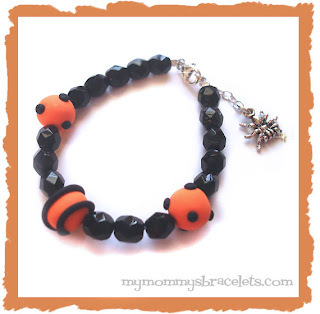 Halloween is just around the corner...I have added a few charms and a couple bracelets to the HOLIDAY JEWELRY section. Check it out...quantities are limited so grab yours quick!